Stimulate and facilitate positive citizen engagement in Port Credit. Port Credit West Village Partners’ (WVP) mission is to stimulate and facilitate positive citizen engagement in Port Credit. WVP is committed to a process that is focused on leveraging collaboration and transparency to streamline the planning process to ensure the highest quality redevelopment plan. WVP understands the importance of community consultation and has learned, through extensive experience, the significance of a collaborative and mutually respectful relationship with residents and other stakeholders in the pursuit of excellent outcomes. Both individually and collectively, WVP has a well-established reputation for community engagement, and for building productive relationships with members of resident associations, ratepayer groups and business improvement areas throughout the Greater Toronto Area. WVP is committed to conducting community consultations as set out by legislative requirements in the Mississauga Official Plan and Peel Official Plan. WVP also will collaborate with municipal and regional authorities to host and participate in all additional community consultations that are warranted and/or beneficial. WVP’s intention is to work alongside all of the appropriate representatives from the municipal and regional levels and other regulatory agencies, to create a unique master-planned community that is both appropriate for the community as a whole, and respectful of the surrounding neighbourhoods. 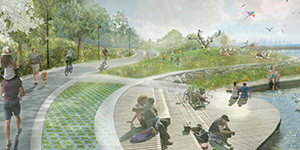 WVP has participated throughout the Inspiration Port Credit process which partnered both City officials and the community in the visioning process. In addition to City staff and consultants, the community stakeholder advisory group included executive members from The Town of Port Credit Association (TOPCA), Port Credit Cranberry Cove Ratepayer Association (PCCCRA) and The Port Credit Business Improvement Association (PCBIA). These community-based organizations represent the most directly affected neighbourhoods, and they already have been engaged in the Inspiration Port Credit process. A collaborative approach to development. WVP is a carefully crafted team that has an outstanding history of designing, building and marketing large-scale and complex master-planned developments. This team brings together the complete spectrum of expertise, skills and resources required for this special Port Credit Waterfront community development. Kilmer Van Nostrand Co. Limited ("Kilmer") is a privately-held Toronto based investment holding company of Canadian business leader and philanthropist, Larry Tanenbaum O.C. With investments in real estate and infrastructure, sports, entertainment and media, and private equity, Kilmer has a long-term horizon of vision for its investments and brings an entrepreneurial and solutions driven approach to project delivery. Over its forty plus year history, Kilmer has actively built or helped to build a number of leading Canadian businesses in such areas as construction and building products, commercial aggregate operations, sports and media, cable operations, electronics manufacturing, textile manufacturing, publishing, food processing, charitable gaming and environmental rehabilitation. Through Kilmer’s investment in Maple Leaf Sports and Entertainment, the company has also been a part of developing the Air Canada Centre and the related adjacent real estate, and partnering with the City of Toronto on the operation of BMO Field and the Ricoh Coliseum. Fostered by the historical experience it has had building roads, bridges, dams, tunnels, transit guideways, subways, and manufacturing concrete, aggregates, asphalt and other construction materials, Kilmer continues to maintain a focus on the infrastructure sector. In 2006, Kilmer established the first private equity fund in Canada dedicated exclusively to the redevelopment of brownfields. In 2011, Kilmer partnered with Dream to design, build, and finance the 2015 Pan Am/Para Pan Am Games Athletes’ Village in the West Don Lands. Dream Unlimited Corp. (“Dream”) is one of Canada’s leading real estate companies. Founded in 1996 and headquartered in Toronto, Dream is an innovative real estate developer and manager primarily focused on the residential and commercial sectors in Canada, the United States and Germany. Dream manages 54 million square feet of commercial properties across three publicly listed REIT’s, one publicly listed hard asset fund and third party real estate funds. Dream’s diversified development business includes development of over 10,000 acres of land in Western Canada including housing, mixed-use communities and retail centres. In eastern Canada, Dream has development operations in Toronto and Ottawa with over 6,500 condominium units and one million square feet of commercial at various stages of development. A few examples of their developments include Toronto’s Distillery Historic District and the Canary District, as well as Ottawa’s Zibi development. All three projects are large, mixed-use, multi-phased brownfield developments. FRAM + Slokker, a Toronto-based developer and builder, is known for its innovation, quality and community building experience. Since 1981, FRAM + Slokker has been developing, building, and project managing in the Greater Toronto Area, Southern Ontario, Alberta and select markets in the United States, and has been at the forefront of developing unique, sustainable, mixed-use neighbourhoods. Harnessing a highly motivated management and construction team, FRAM + Slokker has successfully built over 13,000 residences from custom homes to exceptional single family, multi-family, condominium and rental apartments, in addition to large mixed-used developments, affordable housing, and student housing. FRAM + Slokker is a proven innovator of sustainable community developments, particularly focusing on energy efficiency and environmental sustainability. 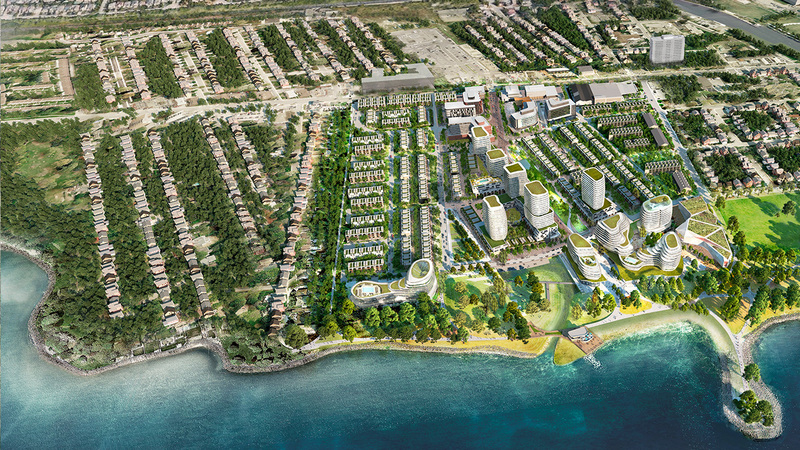 The award-winning Port Credit Village project in Mississauga is recognized worldwide for its sustainable urban form as well as being a successful transit-oriented development (TOD). This project is the subject of numerous tours, articles & case studies, and was a finalist in the 2006 Awards for Excellence for projects in the Americas by the global Urban Land Institute. FRAM + Slokker has the in-house capabilities and expertise to act as both developer and builder, including its large-scale mixed-use developments such as Port Credit Village, Shops at Don Mills and Allenbury Gardens. Diamond Corp. is committed to building on the legacy created by the late A.E. Diamond. The company has a proven track record in planning and real estate development, with an expertise in achieving rezoning approvals for complicated sites. Diamond Corp. has established itself as a leader in the development industry with a focus on projects that add value to the communities in which they work. With over 14 million square feet of Gross Floor Area (not including the recently acquired 70 Mississauga Road South site), projects range from high rise mixed-use development to high density low rise residential projects. Notable large-scale projects in the Diamond Corp. portfolio include The Well, an office, retail and residential hub in downtown Toronto on the former Globe and Mail Lands, and Wynford Green, a new live-work neighbourhood on the Eglinton Crosstown at Don Mills. Diamond Corp. embraces challenging development opportunities, and partners with leading public and private sector organizations. Working together with the local councillor and community, Diamond Corp. is able to achieve their land use goals, creating a development that is sensitive to the surrounding community and achieves key city objectives. On December 7, 2015, the Planning and Development Committee recommended approval of the Framework for 70 Mississauga Road South.